Thank you to the Davis Family Foundation for awarding the Moosehead Marine Museum a $20,000 grant to fund our post-production efforts! The Moosehead Marine Museum received a grant from the Bangor Savings Bank Foundation to help cover the cost of our underwater production efforts over the Summer of 2018! The Moosehead Marine Museum received two separate $10,000 grants from the Libra Foundation and the Fisher Charitable Foundation to support production of this project! Our first oral history interviews were filmed over Memorial Day Weekend 2017. We will be continuing interview production over the summer. Image below shows interview shoot with Rocky Rockwell aboard the Katahdin. 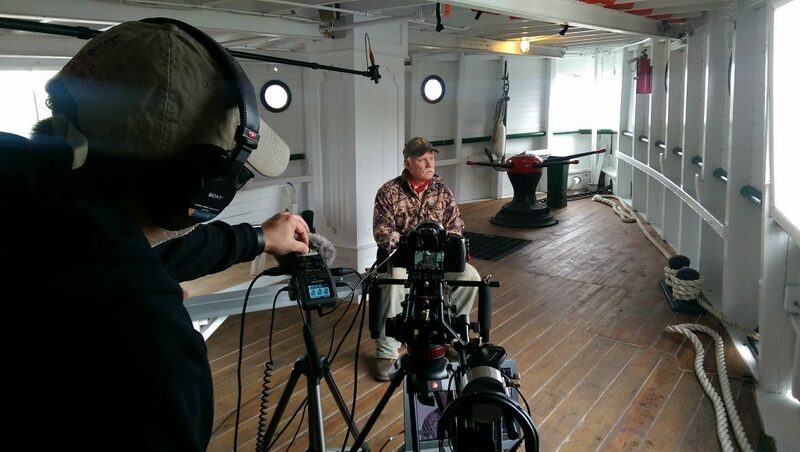 Rocky Rockwell during oral history interview shoot aboard the Katahdin. Jimmy Dimantopoulos, our Sound Engineer operating digital audio recorder on left. To think you could take a train from Boston, New York, or other big cities beyond and be dropped off in the middle of the wilderness, several hundred miles from anywhere…right at the water’s edge of Moosehead Lake, then take a steamboat to a grand 600-guest resort hotel in the midst of the Maine woods. In 1900 you could do this. Thousands of people escaped from the hustle, bustle, and heat of the cities to the wilderness of the Moosehead Lake Region – for the same reasons they do today. Now imagine over 25 steamboats cruising Moosehead Lake ferrying tourists, sportsmen, businessmen, and cargo, or even towing logs. What happened to all of them? While we can’t go back in time, we can visit the underwater remains of the steamboats, show their history, and tell the stories of those whose lives were impacted. By combining high-definition underwater video, interviews, and historic images, this historical documentary tells the real-life tale of three sunken steamboats and what happened to them, while also providing an overview of steamboating history on Moosehead Lake. Your support is needed to make Sunken Steamboats of Moosehead Lake possible. Produced in partnership with the Moosehead Marine Museum, Moosehead Lake Divers, and the Moosehead Historical Society. There are so many ways you can get involved in this project! First, you can make a tax-deductible donation to the Moosehead Marine Museum for this project through our GoFundMe campaign. Second, you can make an in-kind donation in the form of goods or services. Third, become a sponsor and we’ll put your business logo, description, and link to your site on this website…and more! Prefer a more hands-on approach? If you’re a certified diver with video or still photography experience we’d love to hear from you! Also, if you have first-hand experience or were somehow involved in with steamboats on Moosehead Lake, you may be a great candidate for the oral history part of this project. If you have old pictures or any other materials you’re interested in sharing or donating, by all means please reach out! Lastly, it’s free to share…so please share this site, invite your friends to like our Facebook page, and tell your friends and family! At last...here's first Official trailer for Sunken Steamboats of Moosehead Lake! In keeping with the overall approach to the film, this features oral history interviews, historic stills, underwater footage, and for first time, we've incorporated historic moving images provided by Northeast Historic Film. Music score was composed and performed by Tim Maurice. If you enjoyed the video, we always love your 'likes', but sharing this post really helps spread the word about the project! Thank you for your ongoing support and interest! Did you know? The early history of steamboating on Moosehead Lake began at the Forks?